It's the anime version of Road Runner and Coyote. 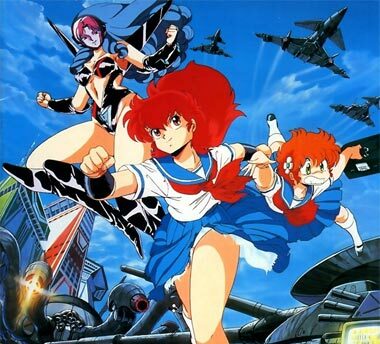 The 1986 movie Project A-Ko spawned a plethora of sequels and spin-offs. It still holds up on its own as a wild, sassy take on superheroes, Japanese school girls, and alien invaders. Student cuties A-Ko, C-Ko and B-Ko have a lot of problems in store for them besides being late for class. They must do battle with a drunken Captain Harlock look alike, genetic mutant students, and each other. Nightmares and fantasies collide as the super schoolgirl genre is written for all others to copy. It is a parody of all things anime while at the same time being one of the best examples ever of the genre as a whole. One of the running gags throughout the movie is that everyone is a girl — even if it looks like a guy, trust us, it's a girl. The film is so packed with power that you're never given a moment to catch your breath, or even wonder why B-ko is so interested in that ditzy blonde — oh, and did we mention that C-ko's an alien space princess? With witty inside-joke humor, and a maelstrom of action ranging from intensive to downright silly at times, Project A-Ko is one of the few anime titles that that has withstood the test of time and gone on to become a true classic. No anime collection is complete without it. Below: Detail from a poster for the first Project A-Ko film.